Copyright laws would presumably be the obstruction to Lay’s creating packaging similar to Pringles perfectly adequate tubes. This must be the reason why the oval shaped cylinder type packaging is made of plastic. 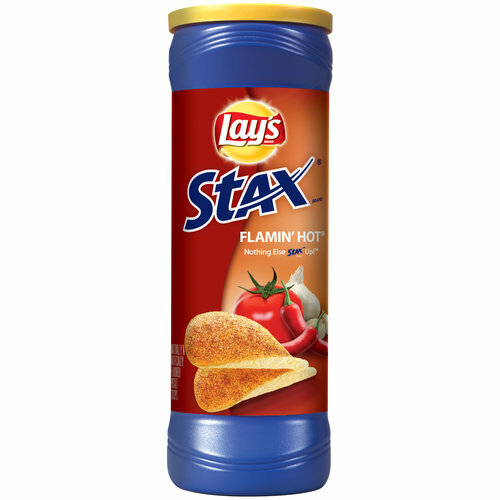 There cannot possibly be any other reason why the world’s biggest Chips company would supply a comparable snack in a worse designed tube sorta thing. The tubes are blue with a yellow lid. 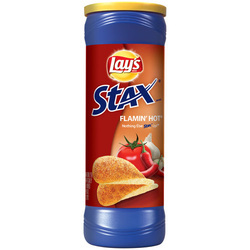 There is a wraparound label that features the Lay’s logo with Stax written beneath and the familiar ingredients photo and a couple of graphic Chips. It does the job, but it does not sell a Pringles-like-product as well. This reconstituted product featured a thick crisp crack, but not a rigid or firm munch. They did not mush up like Regular Chips neither did they break up in splinters as Kettle Cooked Chips can. It was a familiar break-up of the snack which, those familiar with these type of snacks (and most of us are), will know very well. Lay’s have been careful to provide a snack that looks like a Pringle but not quite – the famous Pringles saddle is altered slightly. The bottom surface is plain. The top surface is coated with bright red seasoning powder. This is weird. The hardened potato mash type ingredient has been moulded to include a slightly bobbly surface. A Nose Plunge Test revealed a slight touch of Paprika and this was echoed by the flavor. They were not exactly ‘Flamin’ Hot’ but there was a powdery peppery taste that was reminiscent of many popular European Chips.